The roofing ceremony for the new Nano-Institute which is under construction near Munich’s English Garden took place on Tuesday. 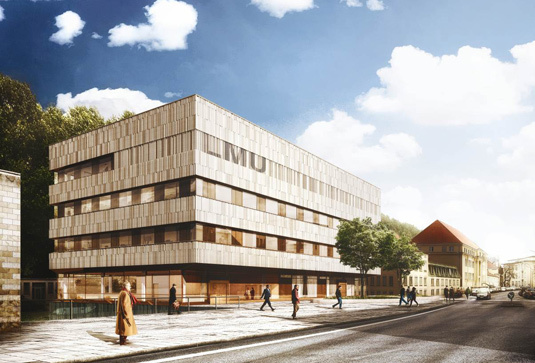 In 2019, two of LMU’s Chairs in Experimental Physics will take up residence in the finished building. The new building will provide laboratories, state-of-the-art clean rooms, offices, common rooms and conference rooms for researchers – and, of course, lots of space for the necessary instrumentation and technology. In addition to Professor Jochen Feldmann’s Chair of Photonics und Optoelectronics, a newly established Chair of Hybrid Nanosystems will also find a home there. The Nano-Institute is intended to provide a major contribution to the infrastructure required to implement the transition to sustainable energy sources (the ‘Energiewende’) in Germany. The Research Network “Solar Technologies go hybrid” will undertake basic research in the areas of photovoltaics and photocatalysis here. The major aim is to explore and develop innovative ways of converting solar energy into electricity and non-fossil energy sources. Indeed, the roof of the new building is designed to accommodate a photovoltaic system as well as test-beds for nanotechnology. Construction will be completed in 2018. The estimated cost of the venture is 33.5 million euros.